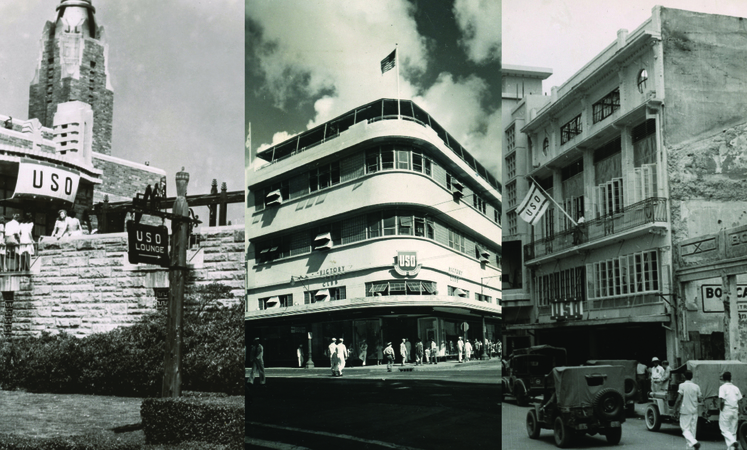 Storefronts, college gyms, coffee shops, churches, log cabins, restaurants, trucks, farm houses—yacht clubs? 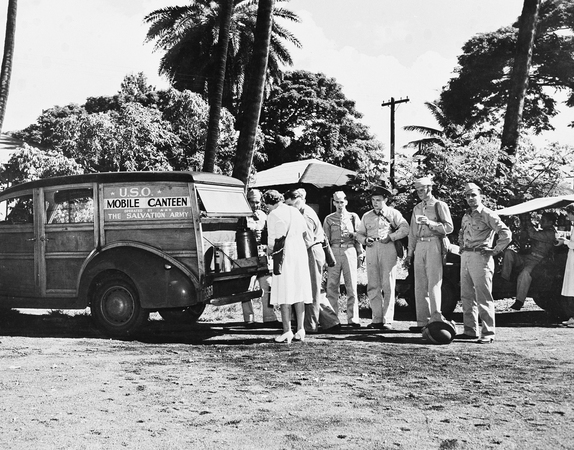 Here was the plan in early 1941: America would use a hybrid model to provide travelers’ aid and some comforts of home for its swelling military ranks. The federal government would build and lease new buildings while citizens and charities would staff and fund these service centers through the newly formed United Service Organizations. Sometimes, it happened that way. More often, local groups got together to make do without waiting for the feds. Early in the war, in San Jose, California, trade union members—carpenters, plumbers, painters and plasterers—pooled their efforts to build a fully furnished club house in one day, according to USO reports. A similar story played out at Wendover Field, Utah. Surrounding communities supplied materials and manpower, and they partnered with personnel from the Army Air Corps to build a club in a day. They put on a dance to celebrate the same night. The USO headquarters in New York City managed marketing strategy, funding drives and standards of etiquette. Heading that effort turned out to be a smart political move. It helped propel the USO’s first national chairman, Thomas Dewey, to the Republican presidential nomination, and its second, Prescott Bush, to the Senate. However, the work of picking volunteers, stocking shelves, baking cookies, making beds and recording the results of this massive national enterprise took place without much oversight. For that reason, it may be impossible to determine where the first dance was held or the first sandwich handed out under the iconic USO banner, although a case can be made for Anniston, Alabama. In a 1944 story on the USO’s phenomenal success, the New York Times claimed Anniston was the site of the first service center. The Anniston Star printed stories in mid-1941 about a successful USO funding campaign and later said the YMCA quarters became a USO club, but the precise date of that shift remains a mystery. One way or another, Americans cobbled together service centers in virtually every American territory and as far away as Brazil and the Philippines. 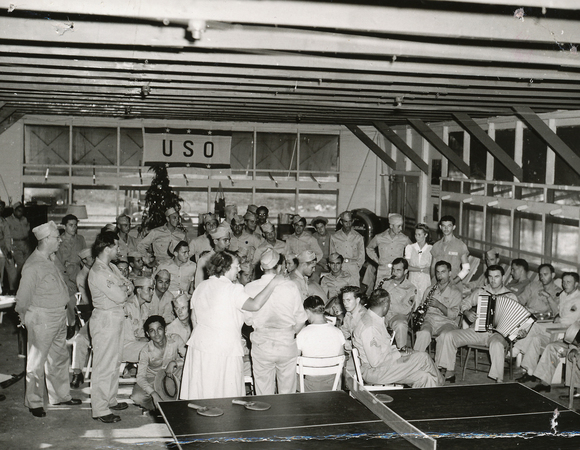 The USO club in Anchorage, Alaska, opened in a church basement in September 1941, but the need quickly outgrew the space. With help from the local American Legion, residents and enlisted men cut timber and began building the Friendly Log Cabin USO in October. It opened the following February, sporting a bowling alley in the basement. USO clubs served coffee, cookies, donuts and sandwiches, but no alcohol. They offered stationery to write letters, bunks to take naps, services to mend uniforms and the latest phonograph records. They held regular religious services and gave out bibles. And many men danced with many young ladies. Gettysburg, Pennsylvania, became a site of USO trial and error—and dancing. The first branch at Hotel Eberhart closed due to lack of soldiers visiting, but when swarms of Army Air Corps trainees arrived at Gettysburg College in 1943, volunteers opened a USO at a former coffee shop and got the college involved, adding an office on campus for liaison between college and USO. “The USO dances were often held in the campus gymnasium, Plank Gym, with female students as hostesses,” wrote scholar Erin Richards. Most of the carefully selected junior hostesses at these dances were between 16 and 20 years old. Jacqueline Dethloff, a current USO Wisconsin volunteer historian, said the Milwaukee service center, which occupied a downtown storefront, partnered with the Red Cross to run the snack bar there. That was rare since there was supposed to be a division of labor—the USO offering services stateside while the Red Cross handled things overseas. But nobody in charge complained. Bending the rules to deliver services became the standard. In other locations there was no such sharing. “The USO took over the former Elks Club Building” in Red Bank, New Jersey, according to a July 24, 1941, Red Bank Register report. More than 20,000 soldiers on leave from Fort Monmouth and Fort Hancock were visiting the facility in a town of 11,000, “severely” straining local resources. One USO parent organization, the YMCA, brought supplies and efficient management to ease the strain. With no central directive for what entertainment services to provide, service centers got creative. A few of the more surprising activities include hypnotism expositions, bobsledding, debating, hairstyling classes, handwriting analysis, harmonica contests, stamp clubs, spelling bees, makeup instruction, honeymoon planning, gold-panning trips and something called “bumpety-bump-bump,” a name game often played as an icebreaker. Donate today to help the USO support millions of military members at our more than 180 locations around the world. The USO’s six member organizations chose not to upset local social norms, seeing their mission to support the war effort as paramount. They provided separate clubs for black service men in places like Hattiesburg, Mississippi, as well as clubs throughout the country focusing on childcare and the needs of uniformed women and nurses. Many well-off Americans opened their doors to the USO. A 1942 LIFE magazine article showed President Franklin Delano Roosevelt setting the example. He turned the opulent President’s Reception Room at Union Station in Washington, D.C., into a service men’s lounge used daily by 1,300 soldiers and sailors. Dr. H. S. Whitacre and his wife regularly hosted wounded service men and junior hostesses for dinner at their “country USO” outside Martinsburg, West Virginia, according to “USO, Five Years of Service: Report of the President.” A flyer from a Detroit service center advertised house parties nearly every night of the week. 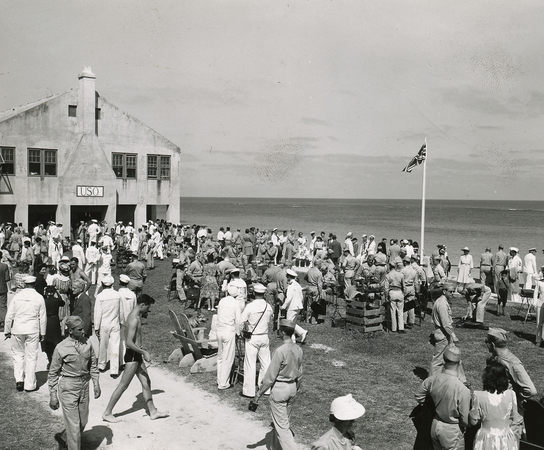 In New York during the early 1940s, community members converted a former Brooklyn restaurant and the Jones Beach Dining Room on Long Island to USO clubs serving thousands of troops. By April 1942, the number of USO clubs and lounges expanded at a rate of one per day and hit a high of 3,035 locations in March 1944. A 1944 New York Times article noted that by late 1943, focus was already shifting toward returning veterans, including those who had been wounded and those in need of vocational training for postwar careers. The services delivered in hospitals and makeshift classrooms grew while the dance hall focus began to wane. Volunteers eventually packed up the mementos of their service center work, and their contributions are still being rediscovered in boxes and archives today. —Paul X. Rutz is an Oregon-based freelance writer and figurative painter. This story appears in the Spring 2016 issue of On Patrol, the magazine of the USO.